Friends is a television show in the Romance genre starring Courteney Cox, Jennifer Aniston, and Lisa Kudrow. The tv show first appeared on air on 1994-09-22. Our users found the overall impression of this television show to be Happy. 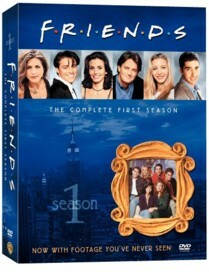 The tv show's official site can be found at www2.warnerbros.com/friendstv. This show is great the cast is just so funny and intelligent. Each episode involves another zany topic for the friends to deal with. Jennifer Aniston (Rachel), Matt Le blanc (Joey), Courtney Cox (Monica), Lisa Kudrow (Phoebe), David Schwimmer(Ross) and Matthew Perry (Chandler) are all fantastic. The basic plot of the show involves watching as these 6 characters deal with life and each other. I don't want to ruin any story lines as this shows writing is great. I will say it is fun and you really get to know and love the characters. The show will draw you in and you will get to see how some of the characters fall in love with others and sometimes each other.